Sometimes, a girl just has to have soup. At least I do anyway! 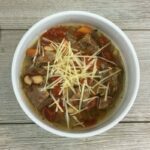 This Italian Beef Soup Recipe is definitely a delicious soup for me. It’s even one I could lose weight on if I wanted to! The reason I decided to make this soup is simple. I wanted to save money and cook with ingredients I already had on hand. Since we buy a side of beef from our local farmer, our freezer is typically pretty packed with different cuts of beef. When I went digging to see what all we had left, I found several packages of stew meat. I always love how easy it is to throw stew meat into a quick slow cooker soup. We always shop at Aldi for the majority of our groceries, because it saves us a ton of money, for our large family, and I already had cans of white beans, beef broth, diced tomatoes and carrots in my pantry,. Those are regular staples for us, that I typically pick up any time I do our big monthly grocery shopping trip. Since I cook from scratch all the time, my spice cabinet is pretty well stocked as well. Anyway, I had tried to make this soup using the slow cooker option on my Instant Pot, but I ended up not doing it correctly and when it was time to eat, it wasn’t ready yet. The carrots were still crunchy! So, instead of freaking out, I decided to pressure cook it in the Instant Pot the rest of the way. It turned out fabulous! I just cooked it for 20 more minutes on Manual mode and that was perfect. This was after cooking for 4 hours on what I thought was high, using the slow cooker setting. This recipe is part of one of my Freezer to Slow Cooker Subscription Plan weekly menus. (Sidenote: There’s currently 400+ happy subscribers who have joined the subscription and it’s growing steadily every day!) . You can print this recipe below… and if you want to see a quick video of how I made it, be sure to scroll to the bottom and watch it. Enjoy!